This import is a custom and very specific import and not available to all customers due to the complexity of import. 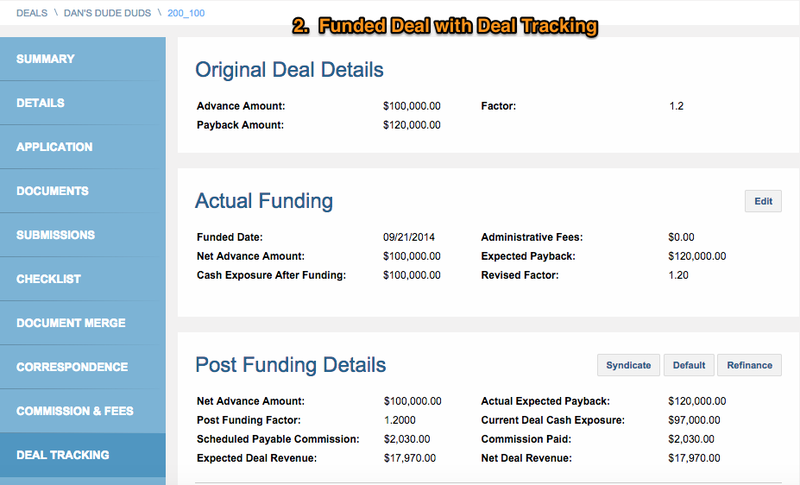 Clients can use MCA Suite to setup and track syndicated deals they participate in as investors with other funders. Using MCA Suite’s syndication deal and syndication transaction import templates, clients can import syndicated deals and transaction directly into MCA Suite. The syndicated deal import process creates the merchant company, deal and syndication set-up all at once. The syndicated transaction import applies transactions to the deal and syndication schedule. 3) the broker gross commission (equal to the broker commission percentage of the advance amount). Clients can import syndicated deals into MCA Suite using an import template. 1) Deal Categories - The import spreadsheet will have a column for Deal Category (classifies the uploaded deal with a particular deal category). Make sure the deal categories you want to upload via the template (to assign to the deals you are uploading) are already set-up in MCA Suite. To do this, go to the Admin main tab, and click on the Setup left-navigation tab. Then click on the Application Configuration tab within Setup. Scroll down to the section called “Cash Advance Deal Category.” Input cash advance categories to match the types you are including in the spreadsheet for the syndicated deals you want to import. Advanced ID from the import template gets copied to deal name (ie, becomes the default deal name) and into the collection method’s “Merchant Number” field. The “Collection Method” Collector company is the same as the “funder” on the syndicated deal. We do this to try and mimic our current upload process. This is why the user needs to choose “Collector” as contact type for the primary underwriter/funder companies. 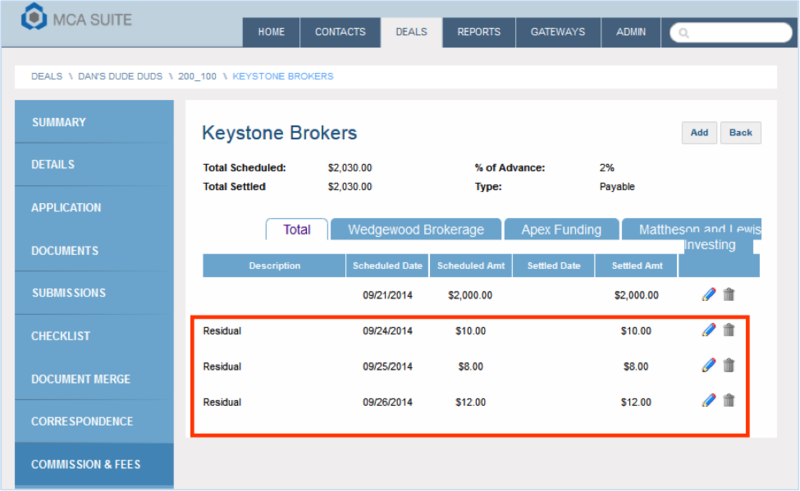 3) Create company records for the companies that will be secondary participants or syndicators on a deal. These companies can be any contact type; we recommend checking them off as “Investor” contact types. 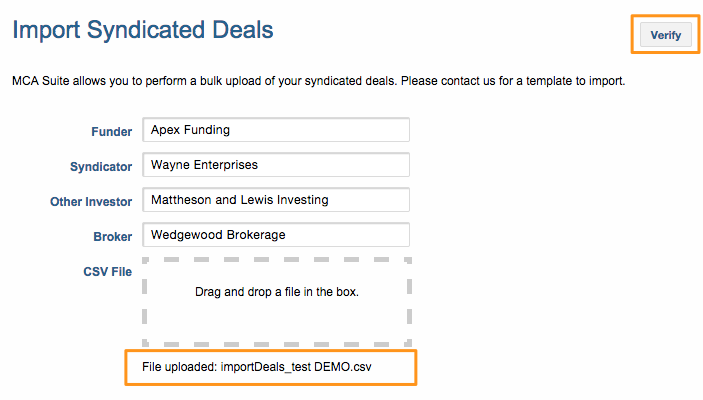 4) Create company records for the Brokers you will be including on the upload spreadsheet and importing as part of the syndicated deal. When you enter the broker companies, on the Add Company page, you will see a field called “Third party Id.” Assign the broker company a Third party ID, and then include both pieces of information on your import spreadsheet. B Advance ID unique ID that ties transactions to deal. must be unique (not previously existing in MCA Suite). Goes into the “merchant number” field in collection and becomes the default deal name. C Merchant ID Unique ID stored for reference in the Company- third party id. Not used for import. I Deal Category Specific category of cash advance. The categories you want to attach to the deals you are uploading via template, must already exist in MCA Suite. To enter in these deal categories, go to Admin > Setup > Application Configuration page, and scroll to the “Cash Advance Deal Categories section to input them. 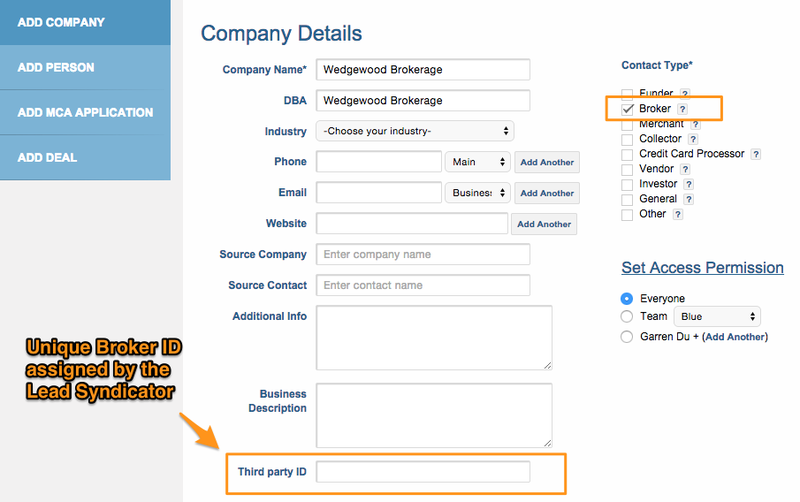 M Broker ID Unique Broker ID - to be entered when creating the Broker Company record, in “Third Party ID” field. T Industry SIC Code or Industry (required; you can set Industries and SIC Codes in the Admin > Set Up > Application Configuration > Industries tab. If you do not use SIC Codes or Industries, you can create a general one and give it a code just for the purpose of this import). Code must be a whole number. 1) Merchant ID MUST be unique in our system (we are creating the new merchant and merchant ID). 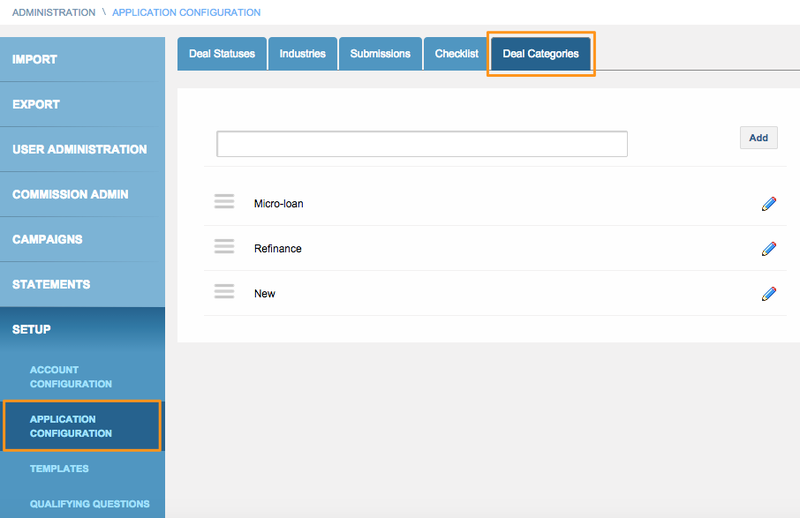 3) Deal Categories listed on the template must exist in MCA Suite. Go to the Admin > Setup > Application Configuration page and then scroll down to the “Cash Advance Deal Category” section to input the new deal categories. F. Syndication Percent + Underwriting Percent + Other Percent must add up to 100. 5) Advance ID and Funder combination must be unique in MCA Suite. 6) Percentages should be written in integer form from 0-100 (i.e., 10% should be entered as 10, not as .10). 7) Advance Date format must be mm/dd/yy (e.g., 12/25/14). To import syndicated deals, go to the “Admin” main tab. Click on the “Import” left side navigation tab, and then click on the “Syndicated Deals” subtab. 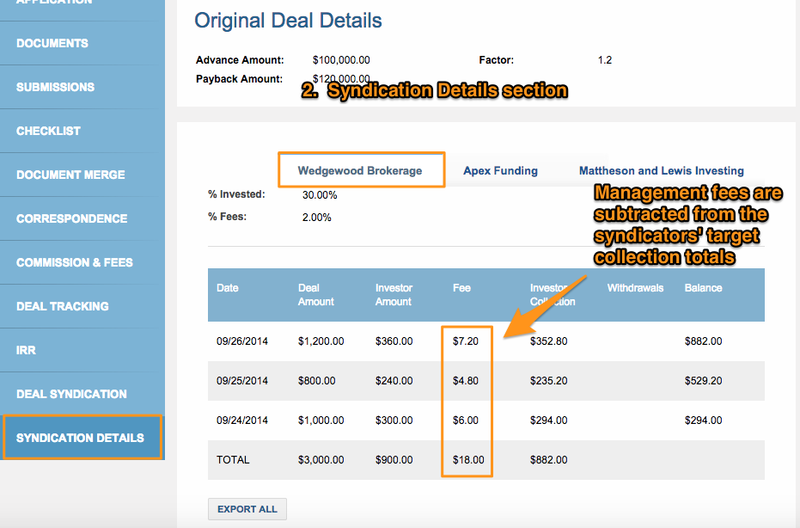 You will see Four (4) text fields: “Funder,” “Syndicator,” “Other Investor,” and "Broker." These fields are “look-up” fields that search against existing companies in MCA Suite; this is why you need to create these potential funders and syndication participants as company records FIRST, before importing syndicated deals. The “Funder” field searches against “funder” or “collector”-type companies. The "Broker" field searches against "broker" contact type companies. “Syndicator” and “Other Investor” fields search against companies of any contact type. After inputting these company names, drag and drop your csv-format import template from your computer onto this page. Click the “Verify” button to have MCA Suite verify and accept the information contained in the spreadsheet. You will be notified if any rows contain some error that prevents the information from being processed. The “Advance ID” column needs to contain a unique Advance ID number. If you attempt to upload a spreadsheet that contains a duplicate Advance ID number, MCA Suite will notify you that an Advance ID has already been used and prevent the template from being processed. Once the information on the import template has been verified, you will see a summary of the deal information you are attempting to import. After you have checked and approved this information, click the “Confirm Import” button. 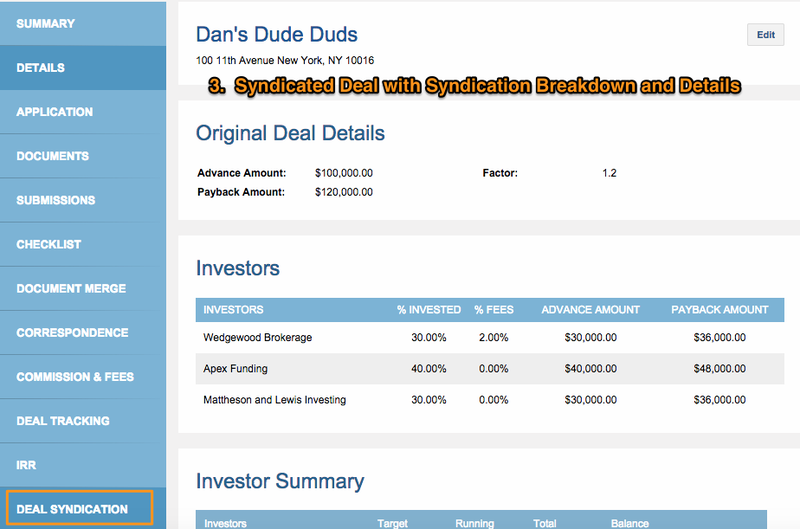 3) create the syndicated deals, showing syndication details and participation breakdowns. NOTE: The default name we give the deal upon import is the Advance ID of the deal + Broker ID (in this example, that is 200_100). You can always change this name to one of your choosing by clicking on the Deal Details tab and editing the Deal Name field. Advance ID Deal ID, required to match the transactions to the deal. 3) Syndication Amount must equal Transaction Amount * Syndication Percentage. 4) Advance ID and Funder must already exist in MCA Suite. 5) Syndication Percentage must match existing syndication percentage for the deal. To import syndicated deals, go to the “Admin” main tab. Click on the “Import” left side navigation tab, and then click on the “Syndicated Transactions Deals” subtab. You will see two text fields: “Funder” and “Syndicator.” These fields are “look-up” fields that search against existing companies in MCA Suite, so you will need to create these potential funders and syndication participants as company records FIRST. The “Funder” field searches against “funder”- or “collector”-type companies, and “Syndicator” field searches against companies of any contact type. After inputting these company names, drag and drop your csv-format import template from your computer onto this page. This is a two-part process: first you will select the file so it sits in our server; then you will click the “Verify” button to have MCA Suite verify and accept the information contained in the spreadsheet. You will be notified if any rows contain some error that prevents the information from being processed. Or you can choose to drag and drop a different csv file template before processing. MCA Suite will run a check to make sure the Advance ID entered on a given line in the spreadsheet file, matches up to the funder on the deal. 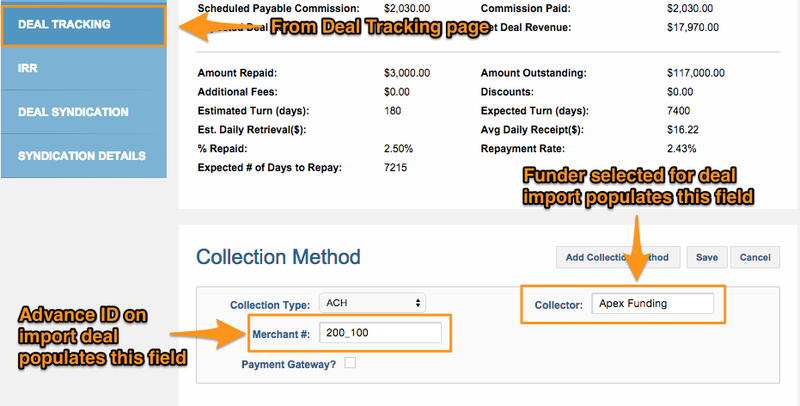 The funder on a deal is the “Collector” company displayed in the Deal Tracking > Collection Method section (after a syndicated deal is imported). The Advance ID will populate to the Merchant # field in the “Collection Method” section of the deal tracking page for a deal. Once the information on the syndication transaction import template has been verified, you will see a summary of the transaction information you are attempting to import. After you have checked and approved this information, click the “Confirm Import” button. 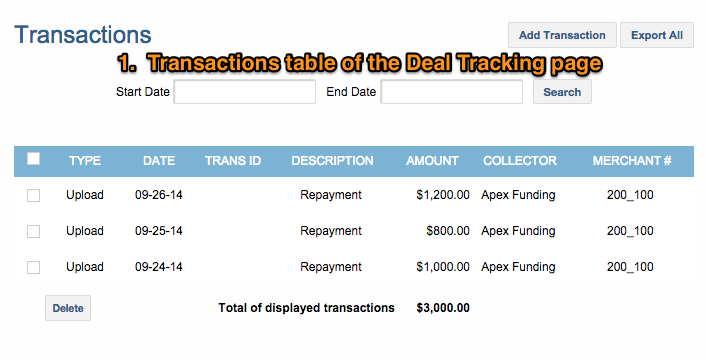 1) The deal tracking page, where the type (“upload”), date of transaction, description (i.e., “transaction type” from the spreadsheet), transaction amount, collector (the “funder” company entered when the syndicated deal and syndicated transactions were imported) and merchant # (i.e., Advance ID) are displayed. 2) The transactions also appear on the Syndication page in a deal, broken down according to various participation percentages. It is when transactions are uploaded that management (house) fees are calculated, displayed and subtracted from syndicators’ target collection totals. Broker Commissions are generated upon Syndicated Deals import. The import creates a commission for the broker associated with the Third Party ID on the imported deal, which displays on the Deal > Commission & Fees page. The Commission Type is automatically created as “Payable,” and the “Broker Gross Commission” on the spreadsheet becomes Scheduled and Settled amount for the commission. “Broker Commission Percentage” displays in the “%” column. You can delete the commission by clicking on the trash can icon, or add new ones manually using the “Add Commission” button. The Transaction Import also includes commission information that automatically creates Residual commissions. These appear on the Deals > Commission & Fees page for the deal, within a particular commission (click on the pencil icon next to the commission) as a list of residuals.